Hi there and thank you for reading this post. I have put myself forward for Governing Council elections for the WHOLE MEMBERSHIP constituency. I would value your vote (if you are eligible to vote of course). I am standing for election to Governing Council as I believe my experience in surveying and my involvement with RICS over the years will enable me to contribute effectively to the future direction of RICS. I have been involved in construction for over thirty years, I became a Chartered Surveyor in 1995 and have been a fellow of RICS since 2005. In 2001 I left a major Quantity Surveying practice to set up my own training consultancy, delivering training and support to surveyors around the world. I am heavily involved with RICS and see Governing Council as the logical next step for me to continue to help RICS and its members. Over the years I have worked closely with RICS Membership Operations and Membership Development helping to develop and advance the Assessment of Professional Competence (APC). I have been an APC Assessor and Chairman for over 18 years and I am now also the RICS UK Licenced Assessor Trainer. Since 2006 I have trained over 5,000 people to become new APC Assessors or Chairmen. This allows me to be part of the future direction of RICS, contributing towards retaining high standards of membership. Since 2002 I have been the RICS Training Advisor for the East of England and East Midlands regions of the UK. Through this role I meet many members, APC candidates and employers who keep me up to date with how they feel about issues affecting them and RICS. Through this interaction I have the opportunity to feed into Governing Council the views and challenges of the members at a grass root level. Whilst I have utmost respect for the RICS brand and values, I feel passionate about contributing toward ensuring a democratic representation of the membership throughout the development of RICS for the foreseeable future. From 2007 to 2011 I was involved in RICS regulation as a member of the RICS Regulatory Board and then the Ethics Sub-Committee from 2011 until its end in 2014. As part of these committees I was required to provide a balanced response on behalf of the membership as I jointly reviewed regulatory and ethical requirements of RICS and considered more recent strategies involving diversity and inclusion. 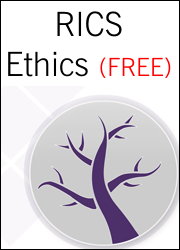 I continue to deliver talks on RICS Rules of Conduct and Business Ethics at RICS matrics events and conferences, promoting the values and goals of RICS. I believe that through my involvement in these various roles over the years I have a good understanding of how RICS is structured and managed and I have a really good understanding of the needs and issues facing its members. I think this knowledge and experience will be of benefit to Governing Council and I hope that I am given the opportunity to continue to help RICS and its members as part of the Governing Council. membership’ constituency for Governing council.